Across America seniors are putting off retirement and staying in the workforce longer. 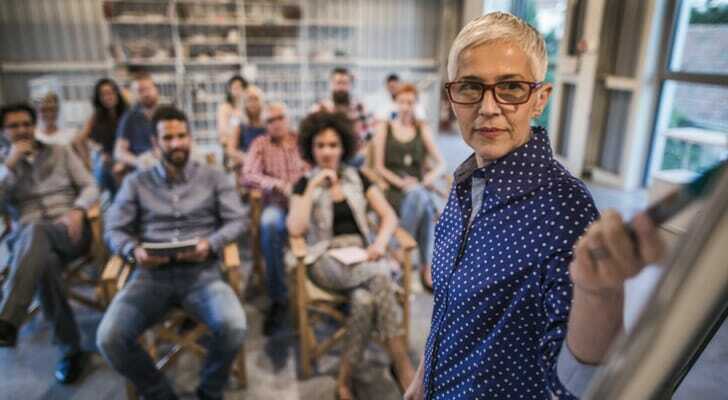 According to Bureau of Labor Statistics data, the percent of Americans age 65 and over who are still in the labor force has nearly doubled in the past two decades. In 1996, only 12% of Americans 65 and over were still in the workforce, while in 2016 that number rose to over 19%. 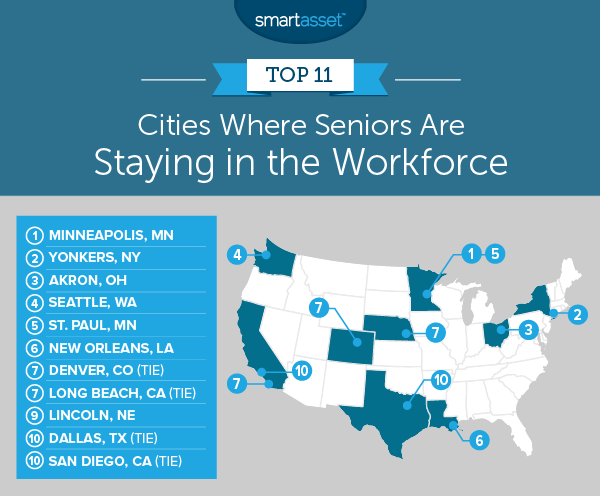 In order to shed more light on this issue, SmartAsset analyzed local data to find the places in America where seniors are staying in the work force. We looked at the 2012 labor force participation rate for residents aged 65 or over and compared it to the 2016 labor force participation rate for residents aged 65 or over. Check out our data and methodology section below to see where we got our data and how we put it together. Across the country seniors are staying in the workforce – In the cities with the largest senior populations, seniors have tended to stay in the workforce longer. Of the 100 cities we analyzed only 11 saw the percentage of 65 or older residents in the workforce drop. Meanwhile in 84 cities the labor force participation rate for seniors increased and in five cities it remains unchanged. You may not retire at 65 – Many people think of 65 as a good age to retire. But depending on where you live retiring at 65 perhaps more atypical than you imagine. The average labor force participation rate for seniors across the 100 cities we analyzed is 17.7%. Minneapolis takes the top spot. Census Bureau data shows that Minneapolis seniors have increased their participation in the labor force by 4.6 percentage points. In 2012, 17.5% of residents aged 65 or over were employed or looking to work but in 2016 that number climbed to 22%. Why seniors in Minneapolis have decided to stay in the workforce is unclear. However one potential explanation for why seniors here feel the need to keep working is the tax burden. According to our analysis, Minnesota is one of the least-friendly states for retirees. Seniors in Yonkers have decided to stay in the workforce rather than retire, according to our analysis. In 2012 under 16% of residents aged 65 or over were in the workforce. By 2016, that number had climbed to nearly 20% for a percentage point increase of 4%. The good news for seniors here is that income for seniors is fairly high. The median household income for 65-or-over households is $47,200. In 2012, Akron had a senior labor force participation rate under 14%, the lowest in our top 10. By 2016 that number had jumped up considerably to nearly 17%. In total the labor force participation rate for seniors in Akron grew by 3.1%. Overall the economic conditions in the city are quite poor, with the civilian population over the age of 16 experiencing an unemployment rate of over 8%. Fortunately, seniors do better. Residents aged 65 or over in the labor force have an unemployment rate under 6% here. Unlike Akron, Seattle is booming. Seattle is one of the top destinations for millennials and rent costs in Seattle are soaring. Even in 2012, it was common to see a senior in the workforce. 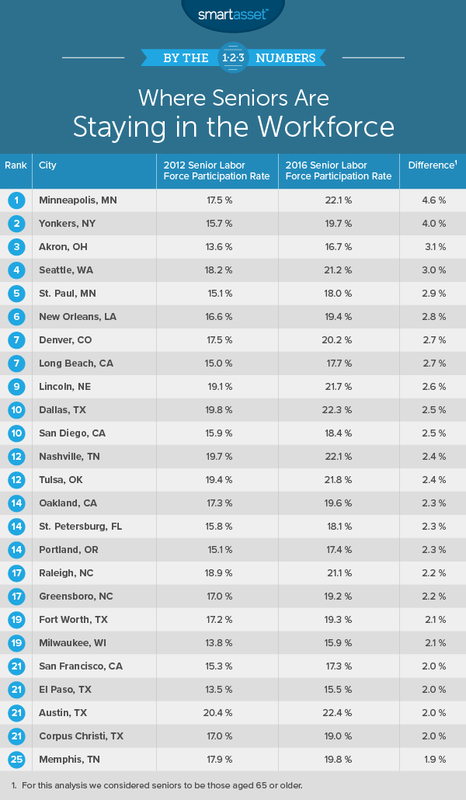 This city had the third-highest 2012 senior force participation rate in our top 10 at 18.2%. As of 2016 that number sat at 21.2% for an increase of 3 percentage points. That means over one in every 5 seniors in Seattle is still working or looking for work. Both of the Twin Cities rank in this top 10. Seniors in St. Paul increased their labor force participation rate by 2.9 percentage points from 2012 to 2016. In both of those years the senior labor force participation rate in St. Paul was lower than in Minneapolis. Once again Minnesota is fairly tough on retirees when it comes to paying taxes, so maybe that is encouraging seniors here to work as long as they are able. Despite being nicknamed The Big Easy, seniors here have decided to take the tough road and stay in the workforce. Seniors in this city tended to stay in the workforce as of 2012 but their participation in the workforce has grown as the years rolled along. From 2012 to 2016, the senior labor force participation rate in New Orleans increased from 16.6% to 19.4%. Many seniors in Denver chose work over retirement in 2012. Data from the Census shows that only 82.5% of seniors in Denver were not in the labor force. By 2016 that number had grown to 79.8%, meaning an additional 2.7 percentage points worth of retirees decided to stay in the workforce. Overall Long Beach has the lowest 2016 senior labor force participation in our top 10. In 2012 around 15% of seniors were in the labor force here and by 2016 that number had grown to 17.7% for an increase of 2.7%. That gives Long Beach the eighth-highest increase in our study. Like in other cities, unemployment here is fairly low for seniors. Only 3.5% of seniors here in the labor force are unemployed. If we were just ranking overall labor force participation rate for seniors, Lincoln would rank higher than ninth. According to data from 2016, nearly 22% of seniors in Lincoln were working or looking to work. That is a 2.6 percentage point increase from 2012 when 19.1% of seniors were in the workforce. One reason seniors here may be encouraged to keep working is the robust labor market. According to Census Bureau estimates, only 3.6% of residents are unemployed and only 1.7% of seniors are unemployed. Dallas comes in tied for the final spot. Seniors in Dallas have typically stayed in the workforce. In 2012, nearly 20% of residents aged 65 or over were working or looking for work. That figure increased by 2.5 percentage points to 22.3%. Seniors in Texas have the benefit of working in a retirement-friendly state both in terms of taxes and cost of living. The last city on this list is San Diego. San Diego would probably be a nice place to retire with its sunny weather and coastal life style. However it’s not a cheap place to live. In general seniors here have decided to spend a few more years in the workforce before calling it quits on their careers. From 2012 to 2016, the labor force participation rate for seniors increased from 15.9% to 18.4%. 2012 senior labor force participation rate. This is the labor force participation rate for residents aged 65 or over. 2016 senior labor force participation rate. This is the labor force participation rate for residents aged 65 or over. In order to rank the cities, we calculated the difference between the 2016 and 2012 senior labor force participation rate. We ranked the cities with the largest difference first and smallest difference last. Data comes from the Census Bureau’s 2012 and 2016 1-year American Community Survey. Never too early to start saving – The earlier you start saving for retirement the better shape you’ll be in when it comes time to retire. For example, let’s say you saved and invested $5,000 at age 35. Even if you contributed nothing else to that $5,000 it would be worth $28,700 after 30 years when you are ready to retire (assuming 6% annual returns). If you saved that $5,000 at age 55 and decided to retire at 65, your savings would only be worth roughly $9,000. By saving 20 years earlier you earned yourself an extra $19,700. Max out your employer matching – While any kind of saving is good, there are smarter ways to save. One of the most efficient saving mechanisms is employer matched 401(k) contributions. Every employer matching program will have different specifics, but generally speaking in an employer matching program your employer will match your 401(k) contributions up to some percentage of your gross salary. By maxing out that contribution you are functionally saving while giving yourself a raise. Make a plan – Every retirement plan is different. Maybe you want to spend your retirement traveling the world or would like to retire in paradise. Regardless a financial advisor can help you to make sure your investments are perfectly lined up in order to achieve your retirement dreams. Our financial advisor matching tool can match you with a local advisor who fits your specific retirement and financial needs. The SmartAdvisor tool asks you a series of questions about your needs, goals and location to find up to three potential matches. You can then read advisor profiles, speak to them on the phone and choose the right person for you. This cuts out a lot of research while still putting the ultimate decision in your hands.